You can pick up all Magnard’s chamber music in an attractive 4-CD box on Timpani 4C4228. If, however, you want to concentrate on the two works here – the violin sonata has for some time rather slipped behind the more compact cello sonata in popularity – you have a good opportunity to do so, as these are excellent, well-scaled performances. Geneviève Laurenceau and Oliver Triendl – doesn’t Triendl ever stop recording? – make a first-class case for the sonata. She’s an elegant, precise, clean-limbed violinist and her instincts are attuned to the flickering moods and temporal breadth of the 1901 sonata, which she traverses with sweep and elegance. She doesn’t indulge in any febrile expressive gestures but equally one doesn’t feel short-changed by her playing. Irina Muresanu, with pianist Dana Ciocarlie )on the AR RE-SE label) are more dramatic and clip a good minute off the CPO team’s timing for the finale, but there’s no doubting the control that the Laurenceau-Triendl team finds in the back-and-forth surge of the scherzo. Similarly they find the right character to convey how the music seems to run in the finale – Triendl’s pianism bringing out the rivulet-passion of the channelled part, the violin earnestly pursuing largely its own course. One can see why the public tended not to stay the distance with the sonata, even when the advocate was the great Ysaÿe, but disc listeners need have no hesitation. For an even more symphonic conception, with Franco-Belgian tone colours galore, try the elite pairing of Dumay and Collard (on EMI). The Piano Trio, in which cellist Maximilian Hornung joins the duo, was written between 1904 and 1905. It shares the sonata’s four-movement scheme but is rather more explicitly Franckian. 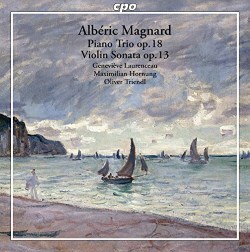 The fluidity of the trio’s moods, the way Magnard slides between sombreness and ebullience is one of its – and his – great strengths. The transitions are finely judged in this performance as is the refined lyricism of the slow movement, its two themes full of textural interest. The somewhat ambivalent waltz figure that emerges in the scherzo – it has a kind of taut foreboding – prepares the listener for the measured slow introduction to the finale. Here one finds some of Magnard’s most exquisite writing, music of ethereal beauty that returns modified, richly but benignly, later on. High praise is due to the CPO trio, who show such sensitivity and delicacy here. Fortunately the studio recording has been well judged and is neither too shallow nor too cold. Christoph Schlüren’s booklet notes are excellent and good on him for advancing Magnard’s cause alongside that of John Foulds and Jean-Louis Florentz. This is a very effective, convincing coupling and I hope it wins Magnard more friends.